Getty ImagesElise Christie crashed out of the short track 500-meter short-track speedskating final on Tuesday. On Tuesday, the British speedskater Elise Christie crashed out of the 500-meter short-track speedskating final for the second Winter Olympics in a row. She has said she got death threats and had to shut down her Twitter account after people accused her of causing a South Korean athlete to wipe out when she fell at the 2014 Games. But Christie has two more chances to medal at this year’s Olympics. 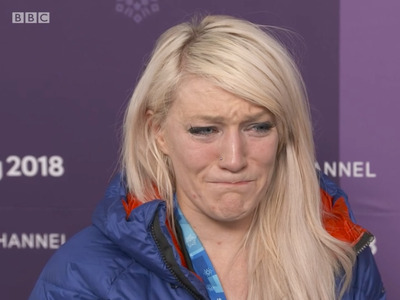 History just repeated itself for one of Great Britain’s athletes at the Winter Olympics. 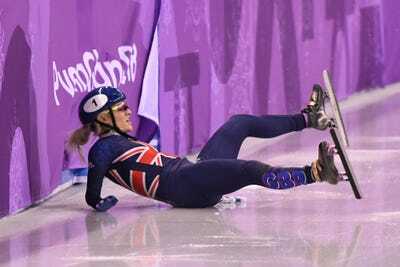 Elise Christie crashed out of the 500-meter short-track speedskating event on Tuesday, four years after a similar tumble at the Sochi Olympics. Christie cruised through the women’s 500-meter quarterfinal and semifinal stages at the Gangneung Ice Arena in South Korea. But during a fiercely competitive final, she was thrown off balance by Yara van Kerkhof, her Dutch rival. BBC screenshotChristie was tearful in an interview with the BBC. At the Sochi Games in 2014, she hit the deck. She says she then received death threats from people accusing her of taking out a South Korean athlete as she fell, leading her to close her Twitter account. “The Korean girl was taken out, and I then received a lot of death threats and online abuse from South Koreans,” Christie recently told the BBC. Christie told The Scotsman last year that she eventually “had to go and ask for some help” from a sports psychologist. But Christie said her South Korean fans were “really sorry for how they treated me” and forgave her. “People became fans,” she said. Despite her fall in this year’s 500-meter final, Christie has two more chances to medal. She competes in the 1,500-meter event on Saturday and the 1,000-meter event next Tuesday. "In my feelings I was knocked over, I didn't fall on my own… I've worked so hard for the 500 and it's been taken away from me"